Universities in South Africa are not in danger of being looted — their assets will not attract the Guptas. But they are in danger of being ‘captured’ by constituencies who do not appreciate their national value or importance and who are content to use any means available to achieve their goals. 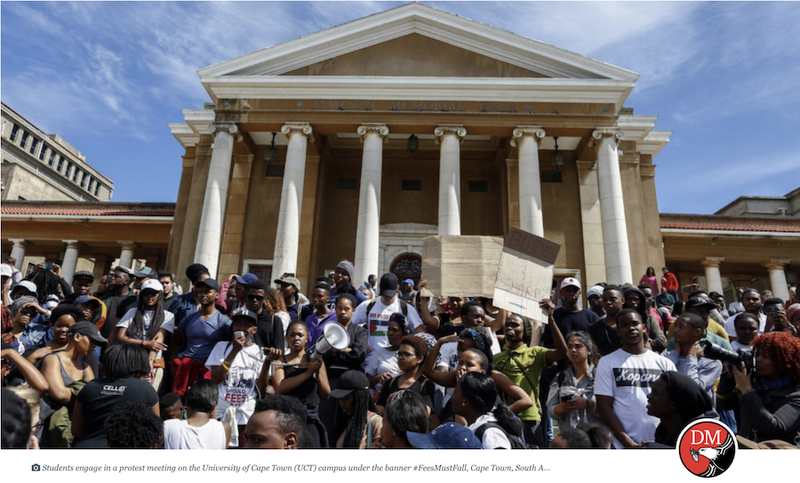 Are South African universities under the same threat as state institutions? Are they being taken over, white-anted and perverted from their intended purpose? In a word, captured? These are questions that flow from the current national awakening associated with the Zondo Commission and other investigations designed to shed light on the recent, murky, political past. For weeks we have heard, daily, further detail about how key state institutions have been reduced, taken over, damaged. We have discovered that the process has been accompanied by dishonesty, bullying, denial, failure of systems to detect or prevent white-anting and the collusion of many officials in these processes. We now have key state institutions which do not properly work — security apparatuses perverted for political ends, looting on an enormous scale to enrich patronage networks inside and outside the country and basic services undermined as the country is plunged into darkness. South African universities have been in the news, mostly as a result of the Rhodes Must Fall and #FeesMustFall student movements. But it is important to remember that South African universities are among the best in Africa. Universities like UCT and Wits have for more than a decade demonstrated that they are globally competitive, producing world-leading research and excellent graduates. In the most recent (2018) Times Higher Education ranking report, UCT was ranked 156th, the only African university in the top 200. By contrast, there were 60 US universities, 29 from the UK and 23 from Germany. Knowledge production is a key feature of the work of universities and there is a legitimate expectation that universities as public resources should contribute to knowledge production. To promote this process various state initiatives (often coordinated and led by the National Research Foundation (NRF)) have since the 1980s been directed towards universities to encourage research productivity. South Africa’s university successes are remarkable because, relative to universities elsewhere in the world, they are seriously under-funded. Sixty-one percent of South African university funding comes from the government, compared to 67% in the US, 75% in Australia and 88% in Brazil (Collyer, Connell, Maia and Morrell, Knowledge and Global Power) (Wits University Press, 2019, 113). Another critical dimension of university work is teaching. South African universities have recently come under immense pressure from the government to improve their pass rates with the argument that government monies are being wasted on high failure rates. As Jonathan Jansen has pointed out, these arguments pay very little attention to the lamentable condition of schooling, the under-preparedness of students entering university and the pressure on university resources. Matters have been aggravated by the NRF drastically cutting its contribution for research and the enormous diversion of funds occasioned by a governmental commitment to free university education. Nevertheless, one can marvel at the resilience of South Africa’s universities. Despite all of this, they survive. But their survival should not be assumed. Jonathan Jansen’s As by Fire warned of a number of dangers as he gloomily predicted the demise of universities in South Africa. But there are other dangers which Adam Habib’s new book has now laid bare. In Rebels and Rage (Jonathan Ball, 2019) Habib describes his experience of the Rhodes Must Fall and #FeesMustFall movements between 2015 and 2018. It is compelling and harrowing reading, but ultimately it raises many important questions. Universities are often public institutions and therefore prone to manipulation and interference by the state. This was an obvious threat under apartheid when the state influenced curricula, staffing, student enrolments and much more. Elsewhere in Africa, the state has often converted universities from knowledge-producing institutions into nurseries for state bureaucrats and technicists and, in the process, destroyed their autonomy and suppressed dissent. More recently, management has been identified as a threat to the healthy university where a combination of neoliberal managerialism and authoritarianism have undermined institutional autonomy and closed down spaces for debate. In Habib’s perceptive book, we now see a new kind of threat — one ideologically cloaked as “far left” and which Habib calls the Pol Pot brigade. This combination of students, staff and outside political parties sought to make Wits ungovernable. With little regard for the rights of others, they embarked on a campaign of disruption, intolerance and violence, often marked by dishonesty, personal incivility and threats. Habib developed what Imraan Buccus (Daily Maverick, 22 March 2019) has called a response of “pragmatic radicalism”. Habib supported the call for free fees, for decolonisation of the curriculum and for attention to be given to demographic transformation, but critically, he refused to cede to a small group the power to determine how such goals would be achieved and to marginalise the majority. This majority was clearly established in a poll that Habib sought in 2016 at the height of attempts to close the university — in which 77% of students and 91% of staff voted to keep the university open. Habib stresses the danger that Wits faced during this time. The press by and large bought the line that student protesters (always in a clear minority) were justified in their actions and their use of violence. Vocal staff were given media platforms to condemn the executive and before long, racism attended the allegation that Habib and his management team were anti-transformation. Anti-white and anti-Indian slogans became widespread, justified on historical grounds stretching back to apartheid. But Habib and his team held firm. He won the support of his staff and students. He took action against students who broke the law and particularly those who committed violence. And he was publicly visible, constantly explaining his actions. Habib makes the point that universities are a national asset, to be protected in their core work even as issues of access, curriculum, staffing and management are addressed. If we now look at what happened at Denel, Eskom, the PIC, Prasa, SARS and the NPA we see a very different trajectory. We see in the first instance senior appointments intent not on protecting the core functions of these state institutions but on looting. This process proceeds because there is underhand dealing, but also because whistle-blowers are targeted, those who ask legitimate questions are silenced. Authoritarian management styles become the norm and a climate of fear secures wrongdoing. More broadly we see the steady development on the one hand of a culture of individual impunity of those in power or those connected to people of influence and on the other, of a gradual erosion of legitimacy and ultimately of the viability of these key institutions. South Africa is a transitional society with very high unemployment levels and youth unemployment at 53%. It is a powder-keg. It would be naïve to think that universities would be immune from pressures and disturbances “outside”. But this should not lead to the abrogation of leadership or the handing over of the keys of the institution to the Pol Pot Brigade. In many, but not all, other South African universities the line to protect these valuable institutions has not been held. Violent protests are all too often tolerated. The need for open debate as a prerequisite for a viable university is surrendered to the noise, abuse and threats of a small minority of protesters. Universities must be places of research and evidence must have a place in deliberation. In the past week, UCT has come into the spotlight as a self-identified “racist” institution based on the Institutional Reconciliation and Transformation Committee’s report. This report received evidence from 80 sources and on the basis of this felt justified in coming to the conclusion that UCT was racist. What about the other 30,000 students, 4,000 staff and the tens of thousands of alumni? “Democracy and social progress die without science and fact-based knowledge. Science and facts are the foundational basis for rational and logical disputation and the possibility of reaching some truths” (Tawana Kupe, “Why science matters so much in the era of fake news and fallacies”, The Conversation, 18 March 2019). At UCT the selective use of evidence, the refusal to take action against student law-breakers, the privileged position given to small groups of staff members and unrepresentative student groupings such as Shackville, who make monopoly claims for a “transformation” label are all features which herald possible University Capture. Staff who ask questions are ignored or humiliated. A similar process of University Capture occurred in the 2000s at UKZN under the Vice-Chancellorship of W M Makgoba. Staff were hounded out, managerial bullying became the norm and under the guise of Africanisation and curriculum restructuring, some of the most academically successful departments were closed down. Universities in South Africa are not in danger of being looted — their assets will not attract the Guptas. But they are in danger of being taken over by constituencies who do not appreciate their national value or importance and who are content to use any means available to achieve their goals. Among these means is a violent protest, “perhaps the single greatest curse afflicting South Africa’s contemporary political system” (Habib, 2019, 52). While State Capture was abetted by arguments of cadre deployment and BEE, University Capture works the discourse of transformation. In doing so it seeks division, not unity. Maybe Habib’s greatest contribution was to work within transformation parameters, but to obtain buy-in. “A consciousness of whiteness does not require silence. Rather it requires the consciousness to participate in collective ownership of the transformation agenda, to recognise reconciliation is not possible without social justice, and to allow these understandings to inform one’s behaviour and discourse” (116-117). Robert Morrell is Director: Next Generation Professoriate, University of Cape Town. He writes in his personal capacity.